We stayed here for two nights, everyone was friendly and accommodating. I wish we weren't running around town during our trip because I would have loved to explore all of the amenities. The creek was very nice and I hear the lake has some good fishing. The spaces were large enough for our big rig and tow. The dog area was very nice as well. Next time, we will stay again!! I highly recommend this park. We really enjoyed staying here and I would suggest this park to anyone in the area. We chose this park because of its close proximity to the Blue Ridge Parkway. There are many things to explore in the area and this KOA allowed us to have a great place from which to launch. 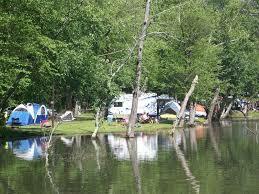 The KOA was an appealing park with a large creek and 3 large ponds, lots of room to run for me. There was also a pool and kids play area, as well as a set-up for corn hole and some other recreational games. The laundry area was nice, ac, and the large dryers were under a covered outdoor area (probably so as not to heat up the washing area), shower/ bath facilities were very clean and homey, decent camp store, and gravel sites. The park was very large, and had a variety of sites to include tent camping (appearing to be very popular on the weekends). My only complaint would be the length of the back-in sites. When we arrived we were able to pull thru bc no one was behind us. However, when we hooked up to leave, it was a bit of a challenge because of the vehicles parked around and in front of you (and no one offered to move their truck so you could have a little extra room to maneuver). What else? They pick your trash up daily at your site, and there was a great BBQ place nearby calked Okey Dokey's (Guy Fieri needs to check this place out for his Triple D), oh and I personally love the sound of the trains, as I grew up around them with my dad working on the railroad. Staying near trains seems to be our signature! Overall, I'd say this KOA is a nice place to stay. Wonderful staff, good knowledge of local area,they sell tickets to Biltmore cheaper than online. Clean laundry and bathrooms. RV park was clean, and pretty quiet for being right off I 40. Sites size are not too bad for a older park.